while using my time productively…let’s not go there. when i was a kid, i had a pen pal. the unknown stranger from across the country who would exchange letters with me. it didn’t last long but it did leave an impression on me. 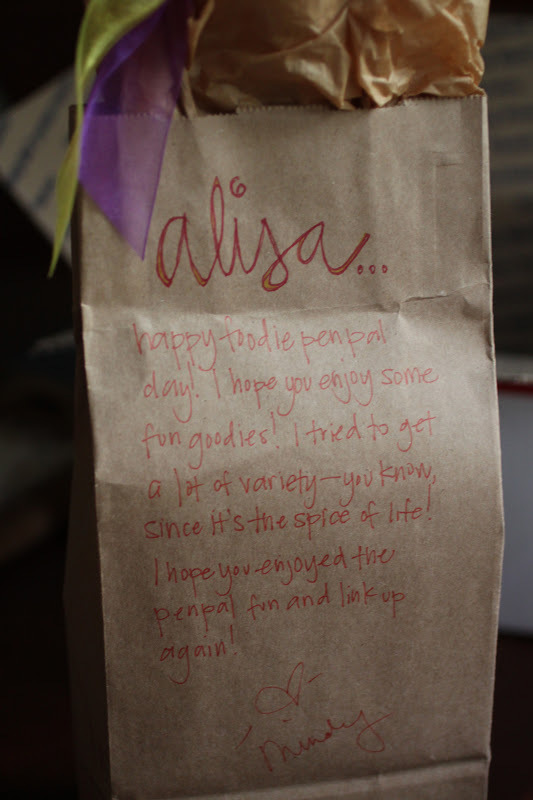 so recently, when i happened upon a monthly event known as the foodie pen pals, not only was i reminded of my long lost “friend” i was compelled to sign up. 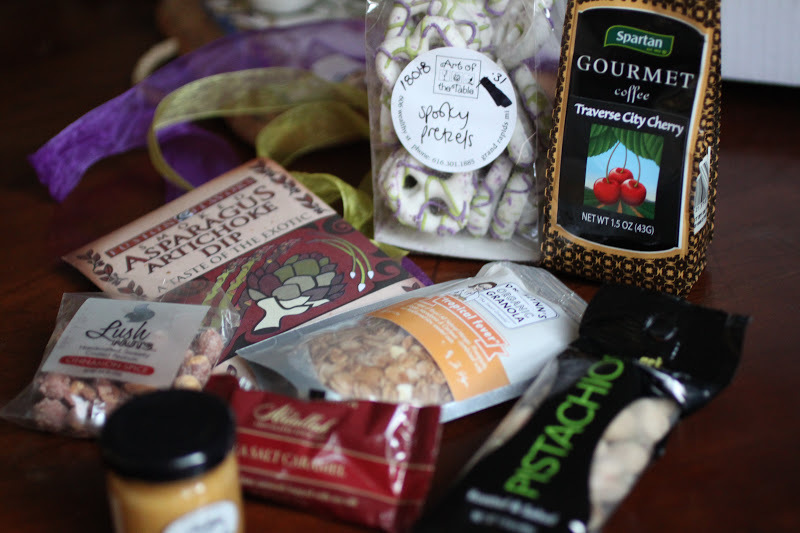 it seemed like fun, send a box of edible goodies to a person and receive a box of goodies from a different person. the whole idea was put together by lindsay of the lean green bean in september of 2011. it started with 30 participants and now has more than a thousand in the u.s., canada and the u.k.. the participants are paired by country; u.s. residents to u.s. residents, canadians to canadians and finally, u.k. residents to u.k. residents. we send/receive our boxes and then we post them. my box came from my partner mindy of just a one girl revolution. the requirements include something written and mindy met that by writing a note and drawing flowers on the bag. it was a lovely touch when i opened the box. she must have been spying on me because she sent some things that i love to snack on! yogurt dipped pretzels, nuts and chocolate…darry has his eye on the flavored coffee. it was hard to keep myself from digging in right then and there but i needed to take a photo first! the hardest part about sending a package of food to a stranger-because we are all strangers at first, is that you never know what they might like. we must be mindful of the obvious such as allergies, aversions or religious requirements and are required to ask that before we shop for goodies. luckily for me, theresa of a spoonful of sunshine, my partner who would be receiving the box had no issues and i was able to send here what ever i wanted. off to the international market i went. i sent her some chinese 5 spice powder because it is wonderful to bake with-try it in any recipe calling for cinnamon. japanese pepper, nanami togarashi is a red pepper blend that i love to sprinkle on stir fries. 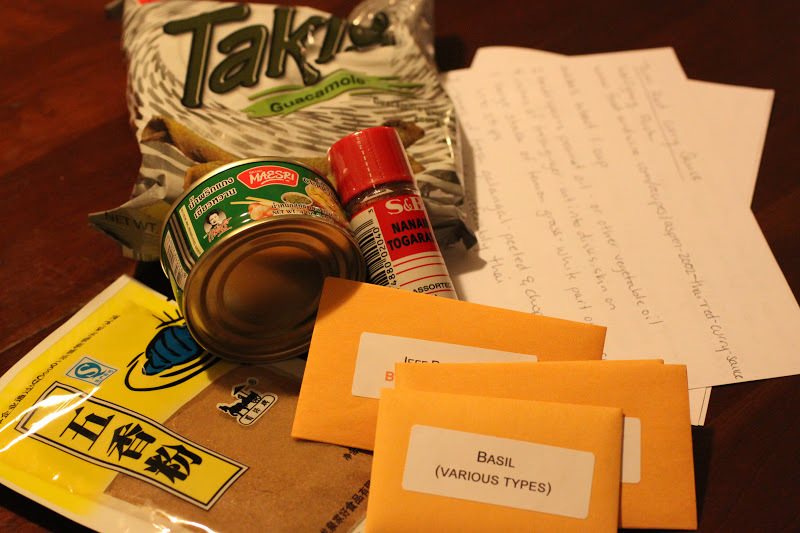 thai green curry is a favorite dish of mine too so not only did i send her a can of paste, i met the written requirement by writing up my favorite curry sauce recipe so that she could try it out. takis, guacamole flavored chips are the bomb! one of my guilty pleasures. and to round it out, seeds for herbs and flowers because i think everybody should try and grow their own food! this was such fun that i will do it again! join the fun, if you can. It was good to come across such a wonderful blog. I would like to visit this blog again.